As per sthalpurana, Narada became free from curse of Brahma by praying to the Lord here and obtained the boon to teach henceforth only "Tatvagnana" to the mankind. Narada wrote Narada Purana here and established Sriman Narayana as the only Paratatva and composed a large volume of 25,000 granthas, formulating the various ways of worshipping the Lord. This temple is called Nakula Pratishta as Nakula undertook its renovation.. The Moolavar is Paambanaiyappan, Kamalanaathan seen in standing posture facing west. Sage Naaradar is said to have done penance here, and prayed to Lord Vishnu to give him the opportunity to preach Tattva Gnanam forever. Naaradar is said to have written Naaradeeya Puraanam at this sthalam. Theertham - Paapanaasa Theertham, Pambaa Theertham. Nammalwar - 3227 - 3237. About 9 Kms from Chenganoor. 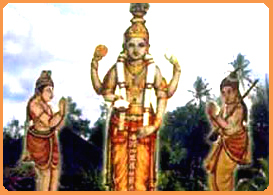 The Moolavar found in this sthalam is Pambanaiappan. (Paambu + Anai + Appan). He is also named as "Kamalanathan". Moolavar is found in Nindra Thirukkolam facing his thirumugham towards West direction. Prathyaksham for Naradar and Maarkandeyar. This sthalam is situated 4 kms away from Sengannoor in North in Kerala state. We can also rach this sthalam by travelling in bus who starts from Thirucchenganoor to Kottayam. Since, this is a small village, there is no staying facility and as a result of this, to get the seva of this sthala Emperumaan, we have to stay in Thiruvalvaazh.